With tax season fast approaching, lots of people are shopping around for someone to prepare their tax returns. But not all tax preparation businesses are reputable. Last year, the Texas Attorney General’s office sued Florida-based LBS Tax Services saying they advertised “the maximum tax refund … for a fee of only $75” but took “hundreds of dollars more from consumers’ tax refunds.” According to the Texas attorney general, LBS had the IRS deposit the refunds into its own bank account, not the customers. Then, LBS would take its cut and give the client what was left. Online, the Team 6 Investigators found an ad for LBS where a woman's voice says "I chose LBS Tax Services and they got me 6,500 dollars back the same day." But that is not the experience Miami resident Yolaysys Gonzalez says she had with LBS. "They charged me 900 dollars and I said wow, I can’t believe it," Gonzalez says. She also says she paid LBS another $300 in service fees and $1,200 in all – or one-fourth of the $4,800 she says she got as a refund. Yurien Escalona is also a former LBS client. In Spanish he tells the Team 6 Investigators he received $100 of the $1,250 he was supposed to get refunded from the IRS. Escalona says that when he called the IRS he was told they didn't have his bank account on file. LBS closed their offices statewide after the Florida Attorney General’s office launched its investigation last year. Yet just weeks ago, Gonzalez received a flyer from a company called Tax Giant. The new company has the same address and the same phone number as LBS. What’s more, the flyer reads “we would like to first thank you for your business last Tax Season.” Then, she got a text and a call. "They told me they are the same company that last year I did the taxes," Gonzalez says. A Team 6 Investigators producer went into Tax Giant with an undercover camera to inquire about tax preparation. It seems Tax Giant’s MO is the same as LBS. Our producer was told if she hired Tax Giant her refund would first be deposited in the company's bank account, then be transferred into her bank. Tax attorney Magda Abdo-Gomez says that is a big red flag. "It's recommended that all refunds, if there’s going to be a refund, go into your own bank account," Abdo-Gomez says. "You should not put it in the preparer’s bank account or any other person’s bank account," she explains. Despite what Tax Giant told its clients, by phone, their attorney denied any affiliation between Tax Giant and LBS. At the Tax Giant Office on Eureka Drive an employee told the Team 6 Investigators they are not the same company but didn't explain how they had access to LBS client information. 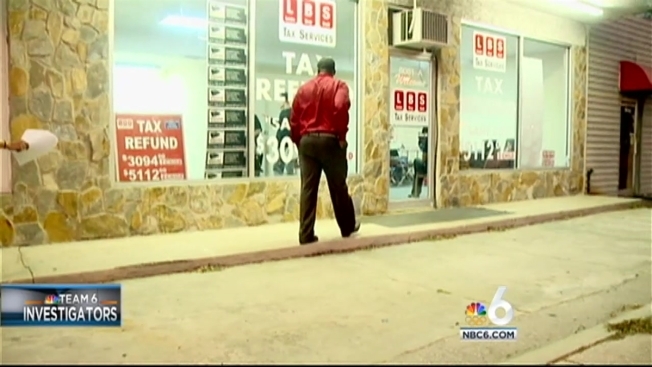 Outside of the store NBC 6 found a client who had just received paperwork from Tax Giant. It turns out they had provided her a copy of the tax return LBS prepared for her last year and told her they were the same company. On the phone an LBS representative told NBC 6 he couldn't explain how they had LBS client data because is it "trade secret information. " Tax attorney Abdo-Gomez says people need to be extra careful when hiring a tax preparer. She says a good preparer should tell you the cost of service up front, charge a flat fee, not a percentage of your refund, sign the tax return and include his or her Preparer Tax Identification Number.